3 Custom Color Specialists cosmetics is a fantastic makeup line. Created by makeup artists for makeup artists, this is a high end line. Scott, Trae, and Chad are the masterminds behind the line. I received the Czarina Collection for review. I have to say I was immediately drawn to it when I saw it on the website, but was quite concerned about the vivid colors. There was no need for that! The Gilded eye shadow is a gorgeous, shimmery copper-bronze shade that’s pretty and flattering. Russian Blue is a great smoky blue shade. And the Ballet Russe lipstick? OMG! Amaze-balls! It’s like the best sheer red-pink lipstick shade ever. I totally understand why Allure loves it! I wore this out and about one day, substituting the 3 Custom Color shadows for my normal BE items. They wore nicely and didn’t fade away. I also have really sensitive eyes and didn’t have any issues with eye irritation. That’s kind of major for me. I was going to post a picture of the shades on me, but I left my camera in St Louis! D’OH! Ah well, I’ll have to see if someone there will email me my pics. Ha! Before I chose the Czarina Collection, I asked about a million questions! Well, it was really three or four, but they answered them quickly and politely. Chad and Trae even helped give me color options and some different styling methods for their line! How awesome is that? Now, to the packaging. If you know me, you know I think that packaging is a part of the presentation! 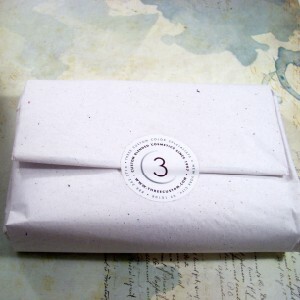 When I took my order out of the box, it was wrapped in sheets of handmade paper. Um, swoon! The 3 Custom Color Specialists line comes in the greatest compacts. The shadows came in a Gunmetal-Charcoal metal compact that had a super-clear mirror in it. The lipstick tube was the same color, sans the mirror. And the cool 3 Custom Color logo was embossed on the top. Very chic. Did I mention that 3 Custom Color also has a lipstick matching program? They do! We all have those favorite makeup shades that the company stops making. Well, 3C will color-match your favorite eye shadow, blush, or lipstick. They can even match your favorite foundation!